Let someone know you're thinking of them with this beautifully illustrated card. Sometimes things happen that are so painful and tough that it seems nothing can be said or done. 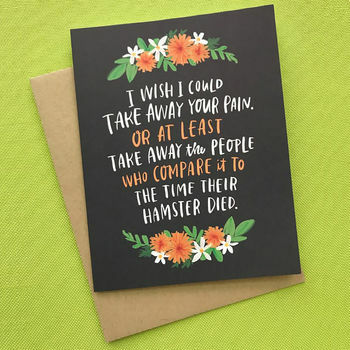 We wish we could take away their pain, or at least the person who compares it to the time their hamster died when they were 4. Instead you can send them this card to let them know you are thinking of them. Designed by Emily McDowell Studio. Offset printed onto heavyweight matte stock using environmentally friendly soy inks. This card is 14cm high and 11cm wide. This product is dispatched to you by Northlight Design.